Welcome to my annual Celebrate Summer Series, where I introduce you to a few of my fellow bloggers and their creative ideas! 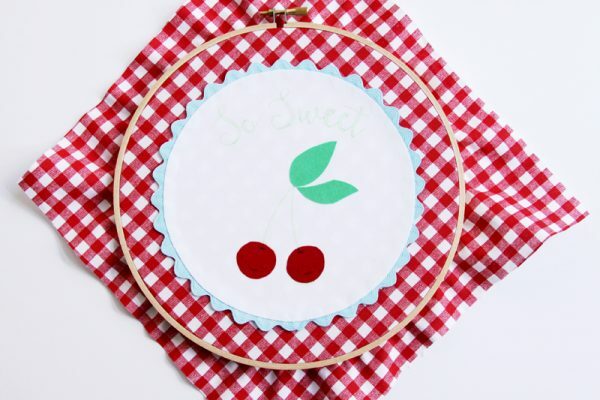 This Embroidery Hoop Art Tutorial is amazing! My friend Bev from Flamingo Toes is one of the most talented gals I know! 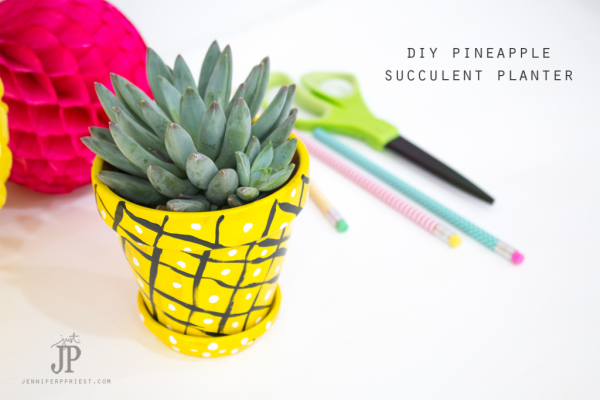 She has the sweetest and coolest ideas on her site. Go look! 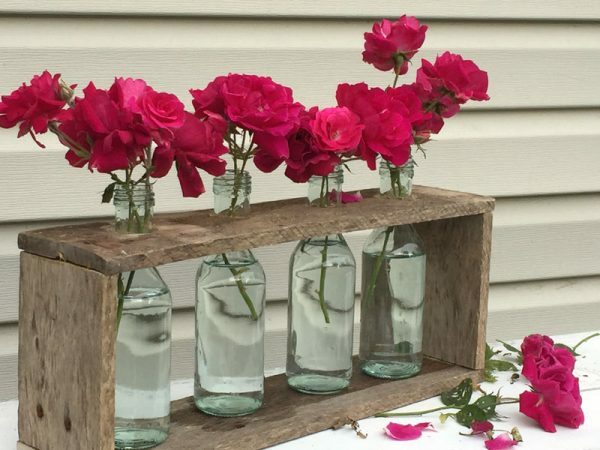 Any day we can create our own DIY Wall Art, is a good day! Hello Today’s Creative Life Readers! My name is Bev and I blog over at Flamingo Toes. I am so happy to be here today as part of Kim’s summer series! 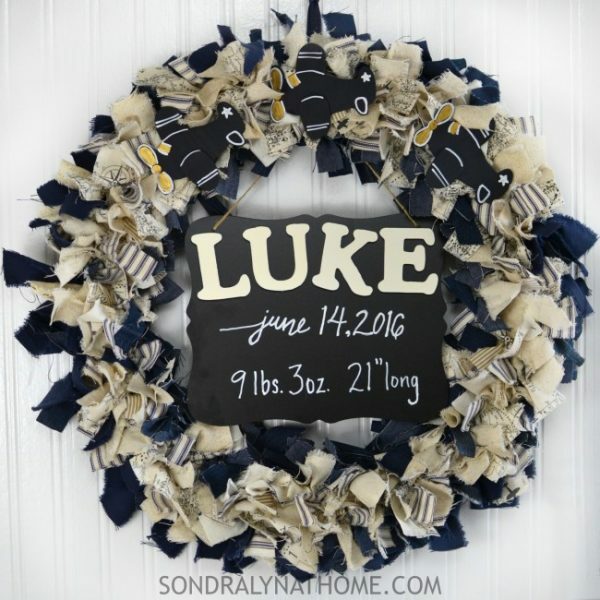 I love sharing all sorts of home diy projects, sewing and embroidery hoop art! 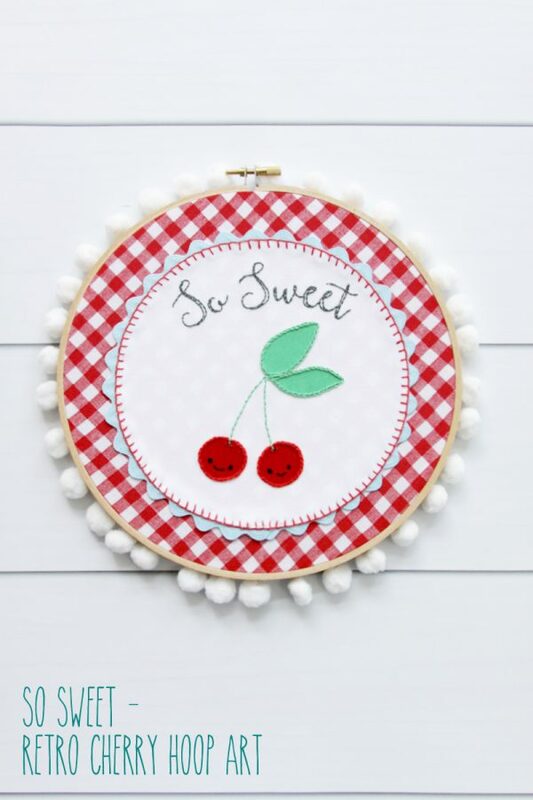 This Embroidery Hoop Art Tutorial for this So Sweet – Retro Cherry Hoop Art just says summer to me – with those cute cherries and red gingham of course! 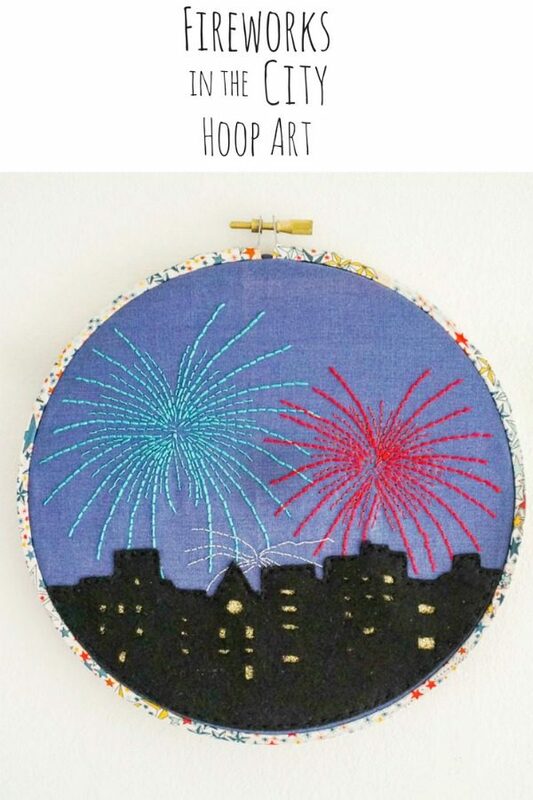 If you haven’t done embroidery before, this would be a great project to start with. 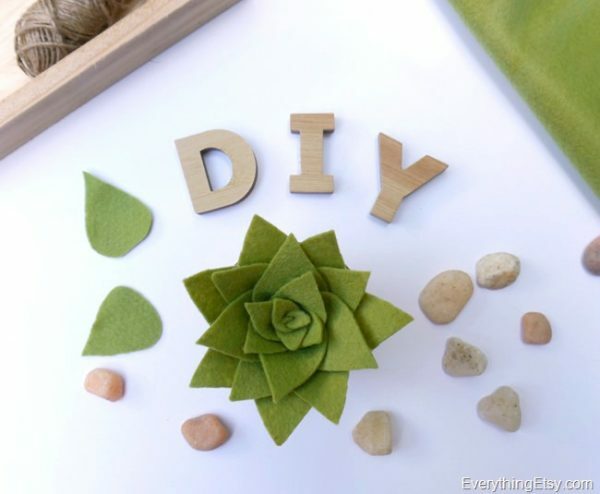 The stitches are nice and basic so a beginner can do them, and it’s an easy project to take along on vacation or even to the park. 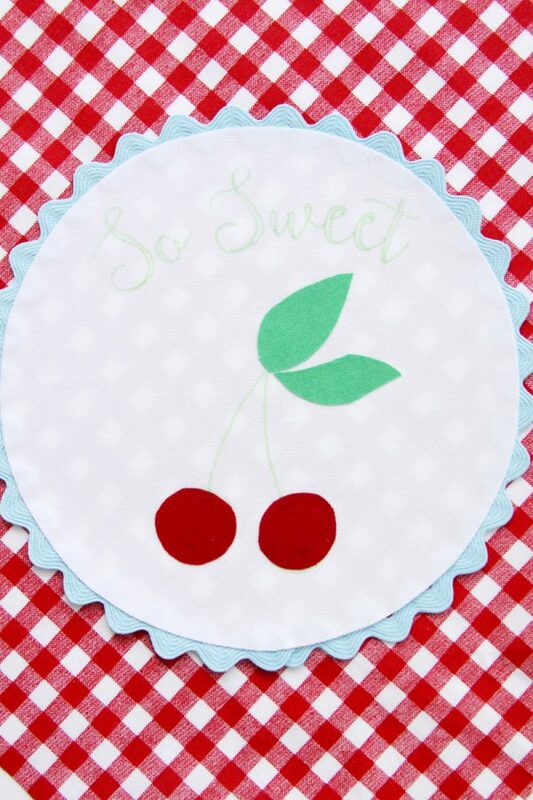 It has such a cute retro style to it too! 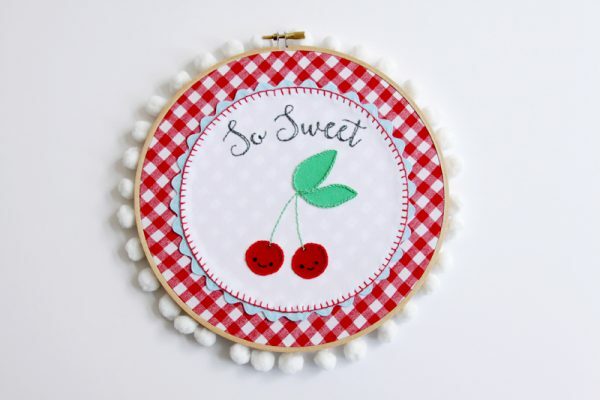 Here’s your embroidery hoop wall art tutorial for this So Sweet – Retro Cherry Hoop Art! 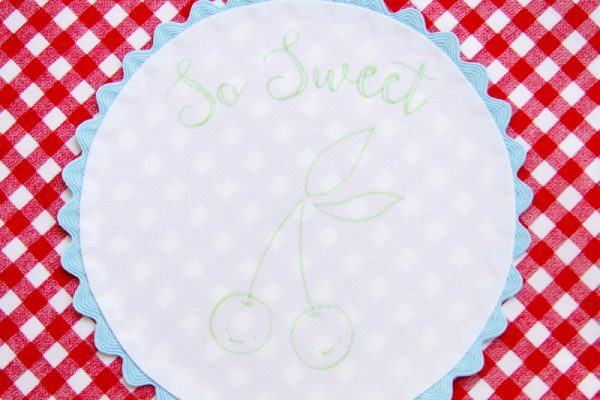 Start by printing out two copies of your pattern – you’ll need one to cut and one to trace. Iron fusible webbing to the back of your red, green and white fabrics. 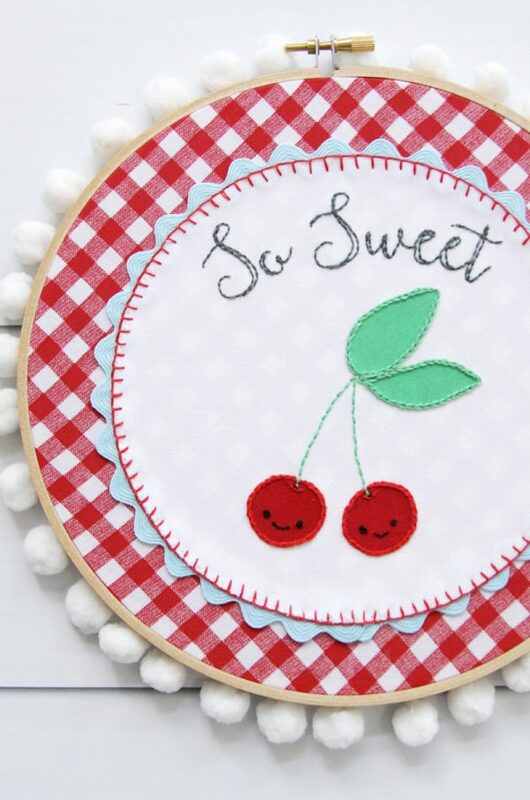 Cut out the leaves, cherries and white circle. Remove the paper backing from the white circle. 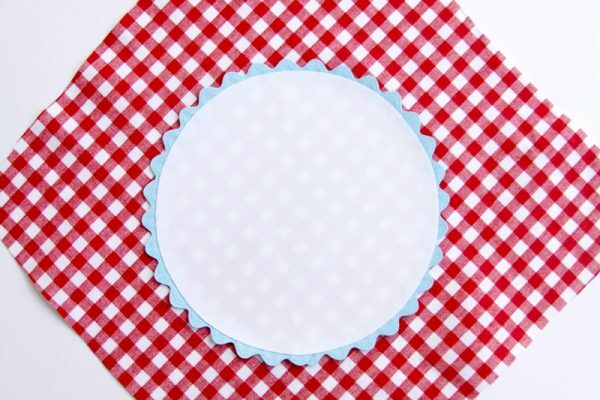 Place it in the center of the gingham fabric and iron down just the center section. Starting at the bottom, tuck half of the rick rack under the edge of the circle, then iron that portion down. Keep going around the circle until the entire piece is fused and edged in rick rack. Trim off your extra rick rack and tuck the ends into the white fabric. Using your transfer pen, trace the wrong side of the other pattern. Iron the pattern onto the white circle. 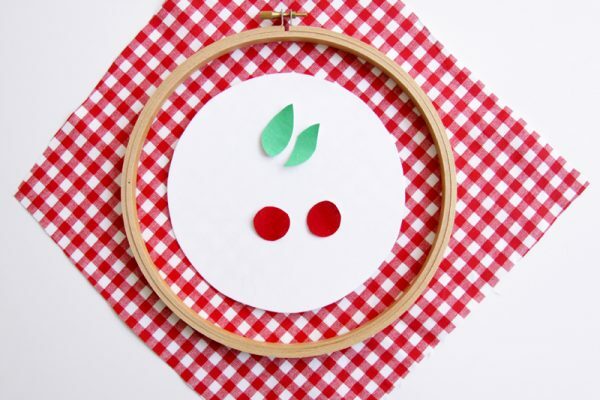 Remove the paper backing from your cherries and leaves and iron them in place. 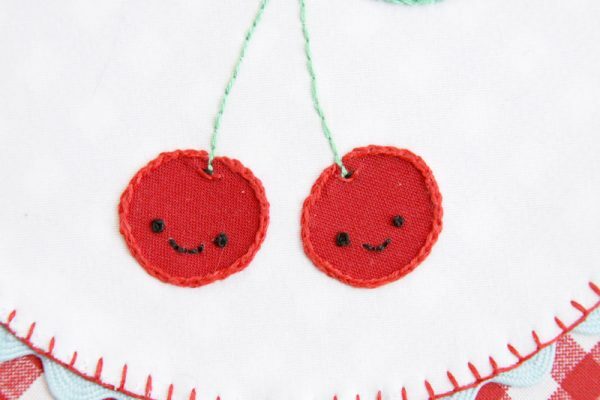 You’ll need to redraw the little stem lines and the smiles on the cherries. 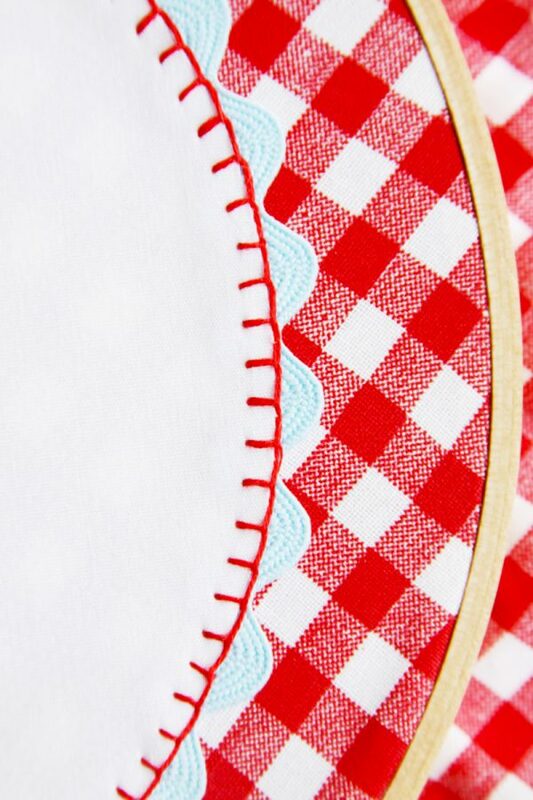 Place your gingham fabric inside the embroidery hoop and tighten. You’re all set to stitch now! All stitches use three strands of embroidery floss. 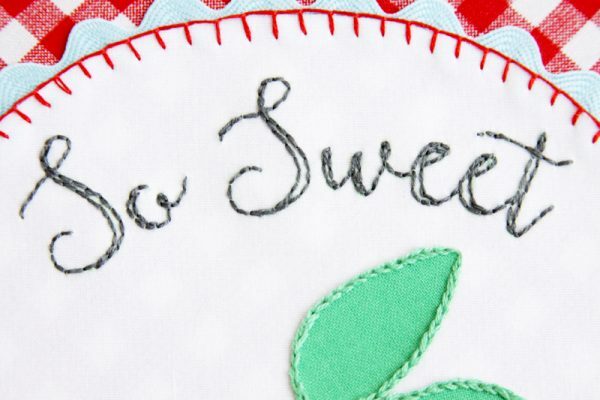 If you need help with the stitches, check out my Embroidery Tips page. 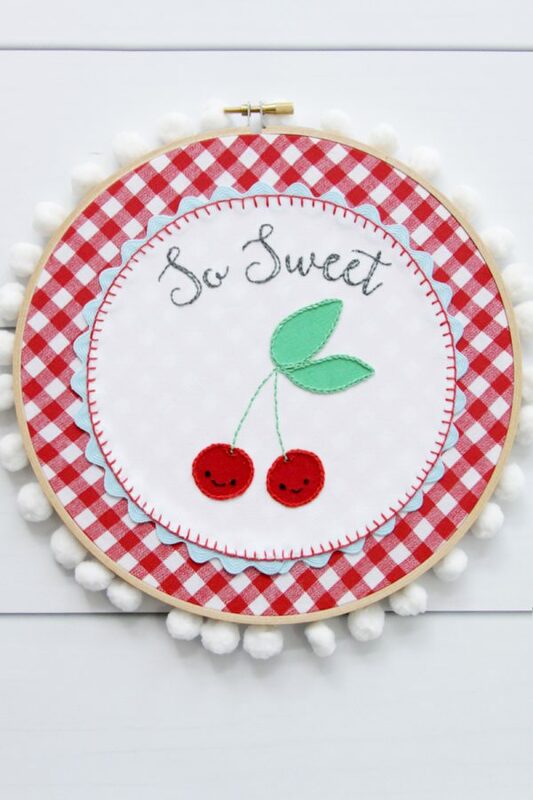 Begin by stitching a blanket stitch with red floss around the entire white circle. 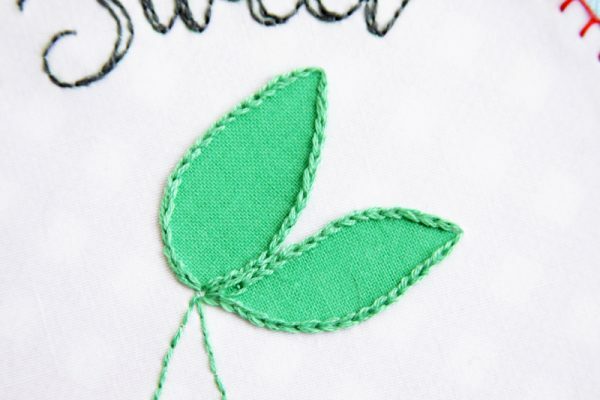 Outline the leaves with a chain stitch and stitch the stems with a back stitch. The letters are all done with a back stitch as well. 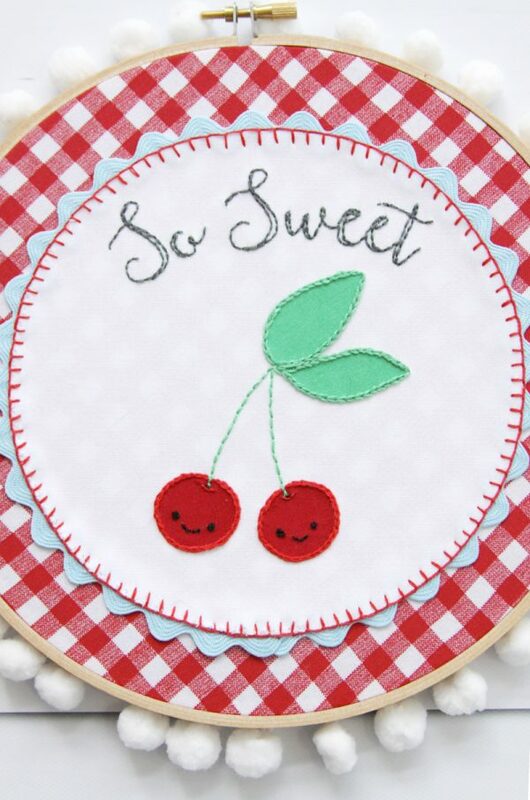 For the cherries, outline them with a chain stitch. Fill in the little curved lines at the top with back stitching in red, then do a single little black back stitch just above that. 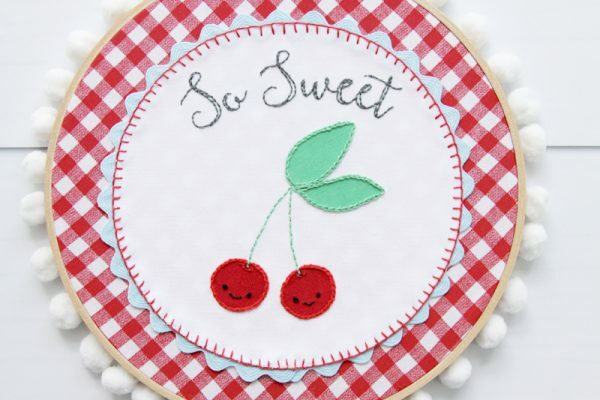 The eyes are made with French Knots and the smiles are back stitched. That’s it! So cute and summery right? I’d love for you to stop by Flamingo Toes and check out my other tutorials!